Meet Gary Roberts, proud owner of Pet World. At the age of 7 Gary knew he wanted to own a pet store. Then at the age of 13 he started working for a bird breeder, cleaning and caring for the birds. Working for the breeder taught him how to breed birds, which he began doing in his backyard aviary. He bred finches, canaries, parakeets, and cockatiels until he retired from bird breeding at age 15. A year later Gary got his first job at a local, central California pet store caring for the small animals, fish, and birds. By the time he was 19 he was working for two different pet stores. At 21 he started working for a pet supply distributer, selling pet supplies to pet stores, feed stores, vets, and groomers. He worked there until he was 25 and then began working for a pet supply manufacture selling to grocery stores and drug stores. Two years later, in 1992 Gary moved to Lakewood, from Santa Maria. 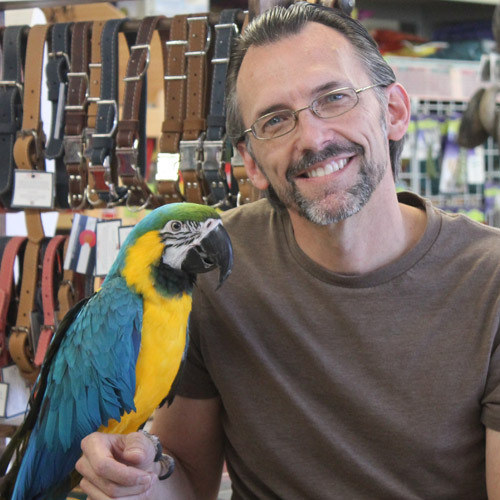 He began working at Pet World, which at the time was owned by Dr. John Roscoe who started the business in 1985. Gary bought the store in 1996 and has owned it since. His mission was to keep it a small, locally owned and family operated store that focused on the health and happiness of his customer’s pets. Pet World has been focused on its customer’s critters for 32 years, making Pet World the oldest pet store in Jefferson County! In 1997 Gary welcomed his first daughter, Jordan, into the world. Many long-time customers watched Jordan grow up running around the store and playing with all the animals. In 2000 Gary welcomed his second daughter, Taylor, into the world. Those committed customers saw her grow up climbing the stacks of dog food and napping behind the counter. Three years later Gary had a son, Justin, who made all the customers smile with his chubby cheeks. Today you can find his three kids (almost) all grown up working for their dad, with the same passion for animals that Gary’s always had. At Pet World we have experienced employees that are well versed in pet nutrition, pet care, and the products we carry. The majority of our employees have been with us for several years like Kelly who started in 1999, working at Pet World after school. Her love for animals and dedication to hard work promoted her to the store manager in 2002. Becky, Kelly’s younger sister, joined her at Pet World in 2003 and has been a happy, helping employee since. Niki is another loyal employee who has been at Pet World since 2001. And of course our part-time employees round us out. They truly are animal lovers and experts, who genuinely care about the health, happiness, and well-being of your animals! Pet World is proud to offer our customers something that most of the larger pet food businesses cannot; superior quality, freshness and good old-fashioned personalized service. We strive to offer a wide variety of high quality, safe, and affordable pet products. At Pet World, we focus on overall better nutrition to improve your pet’s health. We feel that Pet World is much more than “just another dog food store” but rather a place where you can learn the benefits of proper nutrition from our knowledgeable staff who are committed to providing you with options for pet nutrition. Pet World has been a leader in your companion’s diet since the beginning. From the biggest dog to the smallest hamster, we care about your pets’ health. Pet World specializes in hamsters, guinea pigs, birds, and fresh and salt water fish. We also carry natural dog and cat foods, holistic pet treats, USA made pet toys, all the supplies you would ever need for your aquarium, and the freshest small animal and bird food you can find in the Denver Metro area. Our store is well stocked with a wide variety of foods, treats, and supplies to cater to all your pet’s needs. If there is something you need that you can’t find, ask us. Unlike many of our competitors, we are more than happy to special order any available item especially for you and your pet. We would like to thank all our dedicated, long term customers, as well as those who make an effort to shop local. If you are visiting our website to see what we are all about, we invite you to visit our store, and you will be amazed at how many choices are available – we are busting at the seams with products and always look forward to seeing new faces! Stop in and tell us a little about your four-legged, flying, or finned family member(s). We’ll help you pick out a food and get them on the road to a healthier lifestyle.